The passing of Labor’s carbon tax legislation in October was a ‘personal triumph’ for Old Boy Mark Dreyfus QC MP. When the federal government’s carbon tax passed the House of Representatives in October, an Old Boy from the Class of 1973 could claim part of the credit for the success of the controversial legislation. An article in The Age in October described the passing of the legislation as a ‘personal triumph’ for Mark, as ‘he was at the forefront of Labor’s big sell on the legislation’. ‘But,’ The Age continued, ‘the man who many think should be a minister – a ready-made Attorney-General, for instance – remains one step behind’. 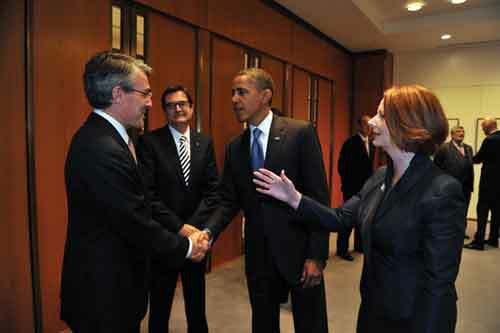 Prime Minister Julia Gillard introduces Mark Dreyfus (’73) to the US President, Barack Obama during Mr Obama’s Australian visit in November. The newspaper attributed this to Mark coming from ‘a world without cameras’, unlike other Labor front-liners such as Greg Combet and Bill Shorten who were well known nationally before entering politics because of their union leadership roles. Prior to being elected as the MHR for the Victorian seat of Isaacs in 2007, Mark was a Queen’s Counsel: a role, said The Age, normally conducted ‘in the closeted confines of the courtroom’. Earlier, Mark had become one of Victoria’s leading defamation lawyers. He also appeared for and advised federal, state and local governments, as well as appearing in several landmark High Court cases, notably the Stolen Generations litigation. At Scotch, which he attended from 1968 to 1973, Mark was politically aware, and The Age referred to his ‘collision points’ – his exchanges of political views with teachers as well as with other boys. Mark said during visits to Scotch since his school days he had been impressed by the continuing improvements to the buildings and facilities, and ‘continuation of the school’s ethos’. *During a speech in Parliament supporting the Military Memorials of National Significance Bill 2008, Mark Dreyfus mentioned Gordon Owen’s English classes at Scotch, in which Gordon graphically recounted his horrific experiences as a prisoner of war of the Japanese.